Ever since D.W. Griffith first decided that movie audiences should be treated to two-shots, over the shoulders, and close-ups, film makers have striven to achieve proper impact by matching one performer's close-up to the other. The accepted criteria for matching has always been head size, but recent studies suggest that there's more to this size matching business than meets the eye. According to the findings of Southern Illinois University psychology and cinema professors, the determining factor in audience acceptance of "matching" close-ups is not head size, but pupilary distance, the distance between the pupils of the screen subject. It is this measurement then, according to the study, that should be used when computing proper lens and distance to subject when composing close-ups. Experiments were conducted based on a theory by Dr. James L. Buchannon that audience attention is directed to the performer's eyes when the close-up is on the screen. Since most people tend to look into the eyes of another person during a natural conversation, Dr. Buchannon reasoned that movie viewers generally concentrate on the performer's eyes if the camera is close enough to feature the eyes, as in a close-up. Using computer retinal scanning techniques, audiences were observed watching television monitors on which typical movie scenes were presented. The procedure verified Dr. Buchannon's hypothesis that the viewer's interest is indeed focused on the performer's eyes during close-up shots. Matches based on pupilary dis tance. The subjects filmed in the test scenes were chosen to present a variety of physical differences from one shot to the next. This included a large male subject, a petite female subject, and a child. The physical characteristics of these subjects is shown in figure 1. In the first series of scenes, exact lens and distance matches were used for corresponding close-ups. In this case, the head sizes in the frame are different since the subjects' physical characteristics are not factored into the matching process. In the second series of scenes, the close-ups were determined by matching the head size (as measured vertically) from one shot to the next. Here, even though there are differences in head size among the tree subjects, they appear as the same size in the frame. Finally, in the third series of scenes the close-ups were determined by the pupilary distance. In this case, the difference in head size is not as pronounced as in the first series, since while the head sizes varied as much as 10% (from the adult male to the child) the pupilary distance only varied by 6%. The effect on the screen is that the area where the viewer's concentration is focused, based on the earlier experiments, remains constant from one close-up to the next. & Photography. By using these two groups, Buchannon and Kiddon hoped to compare the observations of both a "typical" viewing audience, and that of an "expert" audience to evaluate the effectiveness of the three methods of close-up composition. Neither group was informed of the nature of the experiment, but were told only that they would view some film footage and then be asked to complete a questionnaire. The results of the experiment seem to support Dr. Buchannon's theory that the pupilary distance should be the determining factor in matching close-ups. Both the general audience and the group of film students were more comfortable with the close-ups accomplished by matching pupilary distance. Dr. Buchannon suggests that this criteria results in better matches for two reasons. First, there is an exact graphical match on the screen--the eyes-- that help create a smooth cut from one shot to the next. Second, there is a slight mismatch in head size, which Dr. Buchannon believes should exist since there are actual physical differences in the subjects. "The child's head should appear smaller than the adult's, because in the real world the child's head is smaller," he explains, "but the consistency of the image of the eyes, with an exact match in pupilary distance, creates a better graphical transition from one shot to the next." Dr. Kiddon is quick to point out, however, that certain physical characteristics of subjects can cause difficulties in using pupilary distance as the determining factor in matching close-ups. "If the subject has unusually close set eyes, the result in matching by pupilary distance is what I call the Waterston Effect," he stated. "With a subject such as [film actor Sam] Waterston, using this technique can lead to unpredictable results." Dr. Buchannon is not convinced that this is a valid point. 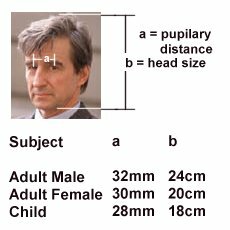 "The Waterston Effect, as Dr. Kiddon calls it, is more likely to be a result, not of the characteristics of the eyes, but of the change in perspective that occurs when Mr. Waterston's head position reveals even the slightest profile, creating the optical illusion of a difference in pupilary distance."